I got the inspiration for my stuffed french toast recipe from Benny’s. I always love their changing menu; I’ve never once been disappointed! The french toast on this particular visit was made with baked-fresh-that-morning-absolutely-perfect-baguette (obviously), and topped with fresh fruit, maple syrup and an crunchy oat crumble. WOW. The only challenge with Benny’s is trying to walk through the bakery on your way out and not leave with a giant bag of pastries. Not really a huge problem in my books! With the long weekend just around the corner, here is a tasty idea for a leisurely brunch! It’s a flavourful French toast recipe that I’ve served at many brunch get-togethers, and it always gets gobbled up. After all the gobbling is usually when I tell people that it’s a vegan recipe….for some reason the word “vegan” tends to scare people, but no need to be frightened! Especially of this recipe! It’s filling, (fairly) healthy and most importantly, delicious. Serve it with a heap of fresh fruit (and some icing sugar if you’re feeling dangerous) for an ideal start to your day. 1. Mix all ingredients (except bread) in blender or food processor. Dip bread in mixture and cook in frying pan with HOT oil. Cook until golden brown. *Replace soy milk with more coconut milk for a richer flavour. I got the idea for this Sunday brunch dish from one of my favourite Ottawa restaurants – Benny’s Bistro. They regularly take two pieces of their amazing bakery fresh bread and stuff wonderful ingredients in between. 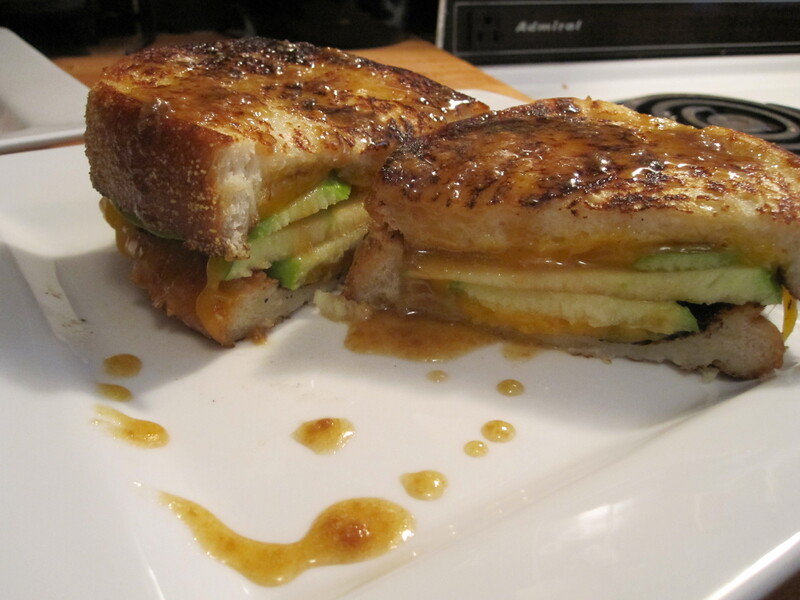 I decided to do a version with tart Granny Smith apples, old cheddar and a caramel drizzle. I thought it seemed like a fancy maple syrup, which is never a bad idea. If you know how to make French Toast, you know how to make this dish. Just fry on one side, flip it over and add your ingredients of choice, and add a second piece, cooked side down to form a sandwich. Tip: If you use something like cheese that needs to melt, put a lid over the frying pan for a few minutes to make sure it gets melty enough. Top with a salted caramel drizzle to finish it off. So decadent. 1. Mix milk, egg, vanilla, cinnamon and salt in a medium sized bowl, big enough for bread dunking. 2. Dunk bread slices into mixture. 3. Heat frying pan to medium heat and melt butter. Add dunked pieces of bread, and cook until golden brown. 4. 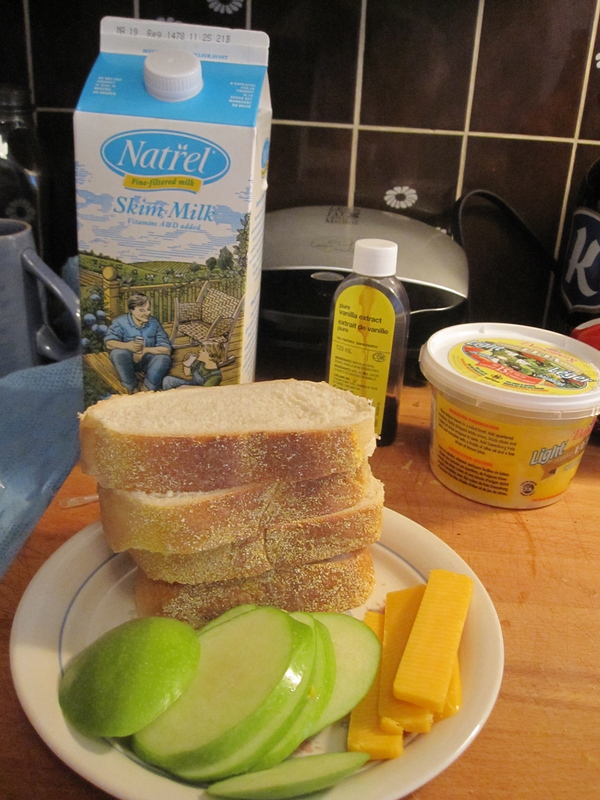 Flip bread and add apple and cheese to cooked side. Top with second piece of French toast, cooked side down. 5. 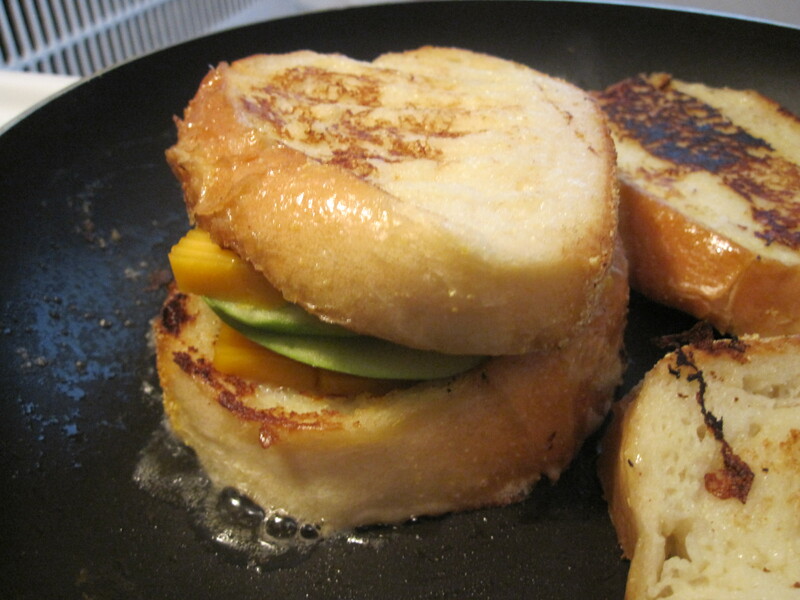 Once bottom of sandwich is golden brown, flip and cook top piece of bread until golden brown as well. 6. Top With Salted Caramel Drizzle and dig in. 1. Put everything in a saucepan and bring to a boil. Reduce heat and allow to thicken, stirring occasionally so it doesn’t scald. Serve when mixture reaches desired consistency.